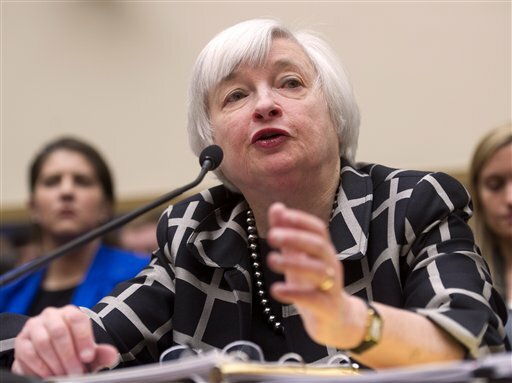 The worlds biggest economy will need Fed stimulus for some time, Yellen said. Yellen said today the Fed hasn’t done enough to combat unemployment even after holding interest rates near zero for more than five years and pumping up its balance sheet to $4.23 trillion with bond purchases. Yellen spotlighted as evidence “real people behind the statistics,” describing how one person, Vicki Lira, lost two jobs, endured homelessness and now serves food samples part-time at a grocery store. Stocks rose as Yellen underscored the Fed’s commitment to spur the economy and put 10.5 million unemployed Americans back to work. Share prices fell on March 19, when she said in a press conference that the Fed might start raising the benchmark interest rate above zero about six months after ending its bond purchase program. Yellen didn’t mention a timetable today. The Standard & Poor’s 500 Index advanced 0.8 percent to 1,872.34 as of the close of trading in New York. The yield on two-year Treasury notes, which are sensitive to changes in Fed policy, fell 0.03 percentage point, to 0.42 percent, near last week’s highest closing level in six months. See also: Janet Yellen to the rescue? Large numbers of partly unemployed workers, stagnant wages, lower labor-force participation and longer periods of joblessness show that “there remains considerable slack in the economy and the labor market,” Yellen said. Today’s speech shows Yellen is inclined to press on with accommodation to boost employment because she focused on slack in the labor market and didn’t mention economic growth or “more hawkish themes” such as the risks from record easing, said Thomas Costerg, an economist at Standard Chartered Plc in New York. At her press conference last month, Yellen emphasized that the timing for an increase in the main interest rate hinges on economic performance. Inflation decelerated to a 0.9 percent 12-month pace in February from 1.2 percent in January and has been below the Fed’s 2 percent target for almost two years. Yellen’s speech today included repeated references to “slack,” a term also used recently by Bank of England Governor Mark Carney to underscore a pledge to keep interest rates at a record low. The Fed, which this month dropped its link between low interest rates and a specific unemployment rate, followed a similar move by U.K. policy makers, who in February tied their outlook for borrowing costs to spare capacity in the labor market and other more qualitative measures. “There remains scope to absorb slack further” before raising rates, the BOE said in its quarterly Inflation Report. Dorine Poole lost a claims-processing job and struggled to find work after two years of unemployment, while Jermaine Brownlee, a plumber and construction worker, “scrambled for odd jobs and temporary work” and still makes less than before the recession, Yellen said. The FOMC has kept the benchmark interest rate near zero since December 2008 and sought to cut borrowing costs and fuel growth through bond buying that has more than quadrupled its assets to $4.23 trillion. While policy makers have slowed the pace of their monthly asset purchases over the past three gatherings to $55 billion from $85 billion, Yellen said the central bank’s “commitment is strong” to helping sustain progress in the job market. The FOMC said in a policy statement this month that rates will likely remain low for a considerable time after the bond buying program ends. The committee said it will weigh a “wide range of information,” including labor-market measures, in deciding when it will eventually begin raising rates. Unemployment was 6.7 percent in February, up from the 6.6 percent level in January that was the lowest since October 2008. The economy added 175,000 jobs in February, more than economists projected, following the weakest two-month hiring gain in more than a year in December and January. After the speech, Yellen toured Daley College in Chicago, including its facilities for preparing students for advanced manufacturing. She joined a discussion with students and employers that partner with the college, including Atlanta-based United Parcel Service Inc. She also donned protective face gear and watched a student weld. –With assistance from Kim Chipman in Chicago and Peter Cook in Washington.